Listen to the interview below (20 min, 23 sec) or download the MP3 here. Darcy: Hi everybody, this is Darcy Eikenberg! I am the founder of the career and success site, RedCapeRevolution.com and the author of the book Bring Your Superpowers To Work: Your Guide To More Clarity, Confidence & Control. This another in my series of interviews with people who I really think are living examples of people who are bringing their superpowers to work. I’m so excited to introduce you to Barbara McAfee. 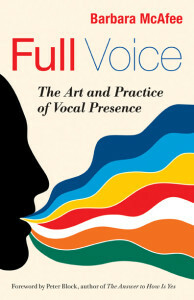 Barbara is a singer, a songwriter, a keynote speaker, a voice coach, and she’s the author of Full Voice: The Art And Practice Of Vocal Presence. Barbara, welcome to the interview! Barbara: Thank you Darcy, it’s a pleasure to be here. D: I’ve had the joy to watch Barbara sing, talk, and teach several times through some of the professional coaching organizations that I’m involved in. It was also great to read her book and really think about all of the different aspects of things that we tend to ignore, which is the voice. We take it for granted. Barbara, I would love for you to share with the group a little bit about what exactly you mean when you say your “full voice”? B: Most of us do take our voices for granted until we get laryngitis or some other thing happens to it. Then we really notice how difficult it is to connect with other human beings. For me, full voice is not just using the voice that we think we have, but really going outside of our “voice box” (to use a really bad pun!) to discover all the sounds that we don’t often access. Most of us think the voice we have right now is the voice that we’re stuck with. Actually, it’s not true. We have a lot more than we think we do. For some reason, we might have shut off our air voice. I used five elements to describe the different colors in the voice – earth, fire, water, metal, and air. Some of us have a dominant sound or two. Mine is fire and earth, mostly. It’s a lower, brighter, strong sound. At the same time, I can access air when I have this great idea that I want to inspire. That’s not my natural way of speaking everyday, but being able to access all the color in my voice makes it possible for me to express more things to more people, and to listen differently to more people. Once you pay attention to your own full voice, you listen to other people differently – not just what they’re saying, but how they’re saying it, and what that might mean. D: In what ways are people using that? As you’re trying to listen to other people, what would the insights of paying attention to someone’s voice, or how they’re using it, bring for you? He had it, but he’s an introvert. It was like we had to teach him a second language that was called, “expression.” He managed to find his way out. He had a great big voice, he just wasn’t used to using it. As he’s been learning how to express more as a passionate leader, he reported (as I interviewed him for the book) that in his experience now, as he’s coaching his employees–the people he’s working with as well as his clients ––he said, “I’m listening to people differently because I’m actually listening to myself differently.” He has ways of understanding the context. So if I say, “How are you, Darcy?” and you say, “I’m fine!” [loudly with anger], [I might wonder] – is that really true? There’s not a congruence between what you say and how you say it. I think for a lot of us, that is happening without our awareness – that what we’re saying and how we’re saying it isn’t congruent, and that makes for a lack of clarity. D: I love that you’re bringing attention to something that I think we do take for granted, or many times we might have an inkling that something’s wrong but we can’t put our finger on what it is. But this incongruence, the fact that maybe your voice or how you’re talking about the things that you’re doing or the energy you’re bringing to it is in conflict with what superpowers are wanting to come out, the things that you really love to do or the things that really excite you. I love the fact that you have some paths in the book to be able to help people find that and bring it out. B: So many people feel bad about their voice. As soon as people find out I’m a voice coach – I’ve heard so many sad stories, “Oh, I’m stuck with this voice that I have. It’s this way or it’s that way. I’m not happy with it.” There’s a kind of fatalism about it. That story tends to perpetuate itself, so people have self doubts and they speak from that self doubt place. Slowly over time, it erodes their confidence. And to be able to say – I’m like the bearer of great news – to say, “Actually, no! You aren’t stuck there. It’s actually possible to change it.” It’s not always comfortable, because I think we form our identities and we fall in love with them. “I’m this way, I’m that way, I’m an introvert or extrovert, I’m shy, I’m a woman, I’m a man, I’m a southerner, I’m a northerner.” All that stuff boxes us in, and then when something new comes in – a new idea like, “I may be an introvert, but I can be an expressive introvert.” Our identity has almost anti-bodies that says, “That’s not us, it must be killed!” There’s a little risk involved in stepping outside of the box, outside of our comfort zone. But frankly, that’s the only place where learning exists. We don’t learn inside of our comfort zone, only at the edges. Our voices are a great way to become better communicators and learn skills about how to use our voices in service to our message. But also, there’s also another layer where as our voices change, so do our lives. One of the quotes I love in the book by Kristin Linklater ,who’s a great voice coach and voice teacher in the theater, she says, “To free the voice is to free the person.” That has certainly been my own experience, and I’ve witnessed it with other people that the voice is a very generous way to learn how to be more of who you are. D: It’s a really powerful path to more clarity. You share some exercises and tools in the book, and you also have some videos online to help people be able to work with their full voice, too. Correct? B: Yes! I knew that we needed to have a video component. The book is actually an enhanced ebook as well, for iPad or Nook Color. Videos and a couple of songs are embedded right in the text. It actually won a Quality Award – my enhanced eBook, last week. But for those who want the paper book or even to just explore a little bit their own full voice, they can go to FullVoice.net and look under the Videos column. You can see each of the five voices demonstrated, and I lead people through a little bit of an exercise for each one. D: Terrific. Barbara, one of the things that I hear a lot from people who like the idea of discovering their superpowers and finding that clarity, and building their confidence that they can bring it forward and taking control of the actions is that the idea sounds great, but then they think that’s something for other people, people that have more fortitude, more time, or more money. But I know for you that you weren’t always this “full voiced” person. You’ve had your own path as well, you spent 12 years in organizational development and had done other things. I’m curious – was there something for you that you know you did to find your path to the work that you do today? B: I think there was a part of me that was just dragging me into it. Sometimes I feel that my voice has just sort of pulled me into the life I’m leading now, because I didn’t have my own voice for a long time. I was petrified – I had terrible stagefright. Which is kind of funny, because I can get up in front of 1,200 people now and be excited and happy! D: Exactly! To see you on stage, I would never think you ever had stagefright. B: I know! I feel like it’s a miracle. One of the things was, I have to say – I fell in love. I feel in love with something, and I think it was something about the feeling of being really alive. The work I do is about the voice, but fundamentally, it’s about being alive. I’ve had a lot of people in my community die in odd ways–a 17 year-old in a car accident or a baby at birth, all these people around me. We lived through a lot of heartache, and sang our way through it a lot. What I realized is that this life is a gift. My fear is interesting, it’s compelling. But frankly, it steals my life from me. Through the experiences of my father’s death and the subsequent heartaches, I really have come to cherish the experience of being alive. I try not to take it for granted – I do take it for granted, we all do. Now I have a hospice choir, so I spend a lot of time with people who are near the end of their lives, singing at the bedside. Boy, that keeps you honest. All the fears do is steal my life. I think I fell in love with my life more and more. That’s not done, it’s an ongoing process of liberation from fear. D: Fear is such a blocker to so many things. I love the fact that even the sadness part of your life continued to become a motivator and a tool for you to continue to be more of who you want to be and who you are going to continue to be. For people who want to find that thing that they can fall in love with in their life, the thing that they want to do with their life so they are always in a state of love, passion, enthusiasm, and all the great stuff that brings radical aliveness–how would they get started by using their full voice? What should someone do or think differently? Well, when you’re speaking, you talk from your head. Your life force, your spirit, your breath gets chopped up into little pieces. But when you sing, there’s an open channel from your deep interior, your soul, almost, your deepest creative center out into the world. There’s no barrier. And that’s terrifying! It’s also very beautiful, it’s why we love to listen to people singing. So I think, even if you’re singing in your car or with your children, or in the shower, there’s something about being able to just make bigger sound with less defense. That is actually a great practice. You get more acquainted with who you are as a voice, also. Yes you’ll have judgment – so what? I just think singing is a really great first step to letting your voice unleash. Make an irresistible play list, put it in your car, and drive around singing all of your favorite songs at the top of your lungs. If you picked different kinds of singers, that’s even better. You’ll sing with Johnny Cash, then you’ll sing with Bonnie Raitt, then you’ll sing with Joni Mitchell. By the time you get to the end of your CD, you will have had a good workout! D: What a fun idea! Also feeling like, what is that feeling doing for you, or what is it telling you? I know when I sing, unlike your friend, I have actually had some singing training and have sang in front of people. But today, to tell me, even though I can speak in front of hundreds of people to sing in front of hundreds of people? I would chicken out. It’s a really interesting exercise to practice singing more as a way to get more in touch with what’s in your soul, as opposed to just what’s in your head. Which, a lot of times when we’re trying to make big changes in our careers and our lives, I find that’s where we get stuck – in our head! B: It’s true. No matter where your ancestors are from, they spent a lot of time singing. We just don’t do it anymore. We listen to music all the time, but we’re not participants. We’ve just become consumers of it. I think part of the reason it’s around us all the time is because we’re starving for something and we don’t even know it. I think singing is an essential part of being a human being. It also gets you used to the sound of your own voice. You have your own voice in your head, and the one you’re used to talking with everyday. Most of us have this battle going on inside. It’s like “Please, someone pay attention to me, Please, no one look at me. Please, someone pay attention to me. Please, no one look at me.” We have this battle between a desire for visibility and attention, and invisibility going pretty much all the time. In order to build your confidence, part of it is just getting used to feeling your own life force moving through you and getting used to holding that much energy in your own body, and through your own voice. It makes it easier then, when you step into the world to maybe access that physical memory of what it’s like to be fully alive and more connected to all of your resources. Not just your head, but your heart, your gut, your body, your life force, your history – all of it. D: I love that as an exercise, just to sing. To let that come out and to practice that more and more often. It’s a great idea. Barbara, you also write and record songs. I’m just curious, do you have a favorite? B: Oh gosh, I have two favorites right now. They’re my favorites because I’m surprised by how they have traveled in the world. They are both on my website at BarbaraMcAfee.com in case people are curious. One is Brain Rats. It’s this really silly song I wrote years ago, and as I was writing it, I even said, “This is just way too silly to ever perform anymore out in the business world where I spend most of my time.” Come to find out, it’s become the most popular song that I’ve written to date. It’s just about the junk that runs around in your head. It has a one word and one note chorus that I’ve had people at the International Coach Federation sing several times. it’s wonderful to see a thousand people on their feet, singing one note and word with our hands up in the air. It kind of has an energy all it’s own. It came to me in a dream. I’m in love with that song, and even people who don’t think they can sing can usually manage one note and one word. There were people from 46 countries, they could sing the one word. Those are my two current favorites. D: That’s great! Brain Rats is a longtime favorite of mine, too, that I got introduced to a couple years ago, it’s very catchy. But also, the idea of the brain rat – everyone can relate. Thank you for sharing that. People can download those songs on iTunes, and also get more on BarbaraMcAfee.com. Is that right? D: That’s great. Well, Barbara McAfee, we think you’re a blast. Thank you so much for sharing your full voice and all of your learnings and thoughts around how we can continue to get clarity, confidence, and control and to be bringing our own superpowers to work. One of the things I now know is, I have to be singing more! D: I have to do that much more often, a great reminder. Thank you so much for your time. 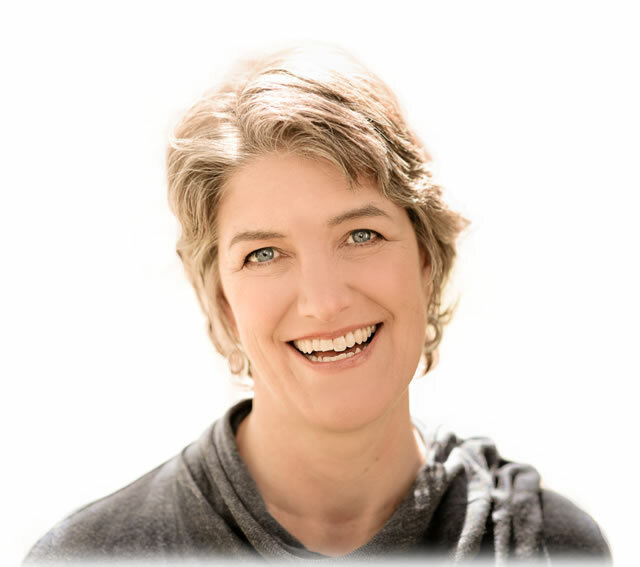 Again, this is Darcy Eikenberg, the author of the book Bring Your Superpowers To Work: Your Guide To More Clarity, Confidence & Control. We’re signing off for now. Thanks for being here!